Today is the start of a new challenge. I have seen the 30 Day Blog Challenge done by various other bloggers and was keen to do it myself, although was a bit daunted at the prospect of doing it alone. I am unsure where it originated as there seems to be many different versions around. 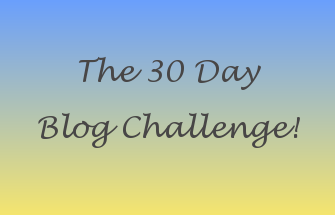 During Sunday’s #psbloggerschat I put the call out for any other bloggers who might wish to join me and happily, there are now fifteen of us doing this challenge. Their links are all at the bottom of the page and I urge you to check them out! This challenge will run concurrent with my usual outfits of the day posts so sometimes I will have a double day of postings! I was born at the end of the 1970’s. My mum was 39 when she had me; I was their “surprise” baby and was not expected in the least! My sister, who was 13 at the time, probably wasn’t too impressed to be sharing her bedroom with a new baby! I had a normal happy childhood until I reached eight and my dad was killed in a car crash. That turned everything upside down as you can imagine and I often wonder if my life would have turned out any different had it not been for the accident. Luckily for me my mum went on to marry my step dad who has been wonderful to me. I decided against the college/university route and took up a position as an office junior at a local firm of solicitors. I am the type of person who values my personal life over my working life and years of schooling just didn’t appeal. At 20 I moved to Ireland and spent six months living and working there with a good friend. It was an experience that I loved, although it did teach me that rural/small town living is not for me and a city is where I would like to end up. These days I am a legal secretary for a partner in one of the biggest firms in the North West. I’m happy in my job, and have some fantastic friends. Love/a relationship is the missing element of my life, but I am sure that when the time is right, it will appear! Don't forget to check out the other lovely ladies involved in the challenge!